Has there ever been a car better suited to the British summer than a Porsche Targa? As many will know the Targa was the result of a happy accident caused by Porsche trying to pre-empt US road safety laws that never materialised. In the 1960s and 1970s the US Highways agency threatened to ban convertible cars due to the weak roll-over protection offered by convertibles of the day. Concerned by this, Porsche developed and trademarked the T-top roll-over bar for their new 911 and launched the car in 1965. As part of a new series of blogs from Footman James, we look at the things you’ll need to know when buying, selling or simply owning classic cars. This March Footman James explains how to declare your car as a vehicle of historic interest, should it qualify! You may be under the impression that once your vehicle has had its 40th birthday, an annual MoT is no longer a legal requirement and you’d be perfectly correct. But it does not happen automatically. You must first register your classic as a Vehicle of Historic Interest to prove that it’s exempt. After a fantastic program of motoring events at The Classic Motor Hub in 2018, we are looking to make this year’s events diary even more special. 2018 brought fantastic weather which in turn encouraged our visitors and clients to bring their classic and sports cars to the Hub for a great Sunday morning of motoring and caffeine. We estimate that last year we welcomed over 2500 cars and 6000 people through our gates to display and chat, and this year we’re expecting even more! After a slow end to 2018 in the car industry, all eyes were fixed for the first round of Retromobile auctions of 2019 taking place in Paris alongside the annual Retromobile exhibition. As with every year the exhibition centre was packed with dealers filling their stands with the best they had to offer whilst plenty of big business was going on behind the scenes. There was a real buzz at the show and more tellingly, at auctions throughout the week. The top marques of the automotive world carry with them some of the most recognisable brand names in the world. Whether it is the prancing horse of Ferrari, the raging bull of Lamborghini or the wings of Bentley, each of these car badges are imbued with their own history provenance that is as much a part of the brand as the cars on which they are emblazoned. 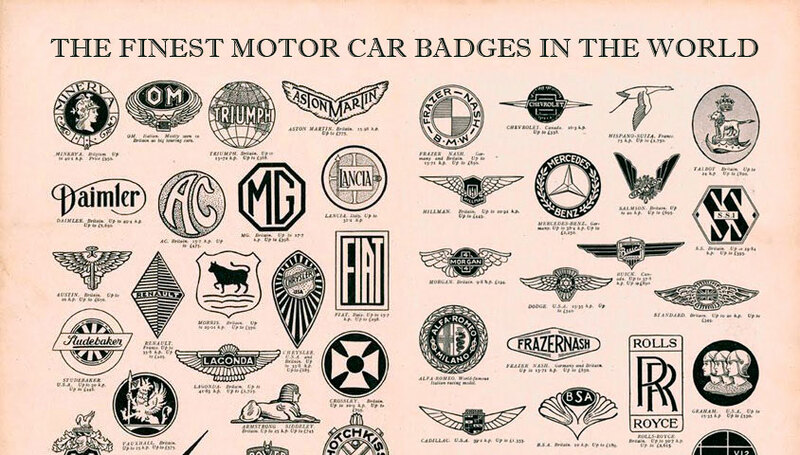 Carry on reading to learn more about the history of car badges from some of the world’s most famous marques. There is no doubt that Ferraris are special cars and therefore are generally some of the most expensive, even when (don’t say this too loud) their competitors sometimes produced better cars. Whatever it is about Ferrari, be it their racing pedigree, seductive Italian style or blistering performance, values have risen pretty much across the entire model range and history. As such, many people who dream about owning an affordable Ferrari have been well and truly priced out of the market making most Ferraris the plaything of the very wealthiest who rarely drive their cars. Going in to 2019 we look back at some of the top cars seen at The Classic Motor Hub. Lots of these cars came as guests to one of our Coffee and Classics whilst others we handled for sale and were able to find new homes thanks to our superb sales team. We look forward to welcoming you on New Year’s day and other events starting in April, and hope that next year we can put together an even more exciting list! Those of you who have come to The Classic Motor Hub’s famous Coffee and Classics will be familiar with our Motor Mart magazine, in the centre of which we publish our guide to the very best Cotswold pubs. In order to show our continued support of these fantastic locations Charlie Metcalfe and myself (Will Stoneham) thought it best to arrive in style in some of the latest cars to come in stock at the Hub: a Minerva Blue 1977 Porsche 911 3.0 and a restomod Jaguar XK120 were the perfect picks for what turned out to be a pretty good day at work. In a new series of blogs we get the lowdown from Footman James on things you’ll need to know when buying, selling or simply owning classic cars. This December Footman James looks at the important rules and regulations surrounding black and silver number plates. Since 1903, it has been a legal requirement for vehicles to display a number plate. Since then, the number plate has gone through several developments including the 1973 change from black and silver number plates to yellow rear and white front reflective plates. The classic car world runs on passion (and quite a lot of petrol). Mille Miglia eligible cars can be pretty unrewarding at times; when they prove unreliable or when the weather is uncooperative it is only enthusiasm and a lot of dedication that can keep spirits up and the passion alive. However, when the car is running smoothly, the roads are clear, and the weather is fair there is a warm almost smug feeling that fills you with joy and allows you time to enjoy the scenery, the car and the people you are with. There is one event that takes place every year in motoring’s Mecca – northern Italy – that gives you all these sensations in the extreme across its 4-day running. That event is the Mille Miglia: the most beautiful race in the world. The last 3 years have passed quickly for The Classic Motor Hub. After purchasing the 5-acre Bibury site, Martin Chisholm and the team have worked tirelessly to create a unique home for motoring enthusiasts to gather at events where they can share their passion. On the 25th October 2018 all the hard work was rewarded as the best of the classic car industry gathered at the Sheraton Grand London Park Lane Hotel for the Octane Historic Motoring Awards. The Classic Motor Hub joined the Industries’ elite businesses, nominated in the prestigious ‘Specialist of the Year’ category. The BMW Z1 is a rare car, launched in 1989 it was new and interesting but not something the industry was particularly blown away by and honestly speaking, the Z1 didn’t stay in the spotlight for long. However, car enthusiasts noted it as something different, quirky and today the Z1 is seeing somewhat of a resurgence. The summer events program at The Classic Motor Hub has come to an end and so we thought it appropriate to take a look back at what we hope everyone will agree was a fantastic summer of Coffee and Classics. Over the summer of 2018 we have held 17 events, not only including Coffee and Classics on the first Sunday of the month between April and October, but meetings for individual marques such as Jaguar, Aston Martin and Porsche. The variety of vehicles that attend these events has been truly fantastic and really speaks to the values of The Classic Motor Hub, sharing the passion of motoring. The Jaguar XJ12 is the benchmark saloon car. Even today, some 45 years later the XJ12 has a lot to teach even the most luxurious modern German saloon offerings and some might say that no manufacturer has since managed to capture the presence of the XJ12. The original plan for the eXperimental Jaguar (XJ) project was to create a low-slung, four-seat sports saloon with the ultimate aim of creating a four-seat E-type. In this regard Jaguar invented a whole new class of car: the luxury sports saloon. The only real rival at the time was the Mercedes-Benz 280SE which was far more expensive; there was no BMW 7-series and Audi only offered the 100 with a 1.9L engine, not quite in the same league as the mighty XJ. This year Lotus celebrate their 70th anniversary and to mark the occasion we decided to get to know one of their most famous models. The Lotus Esprit was launched in 1976 under the stewardship of the great Colin Chapman who enlisted renowned designer Giogetto Giugiaro to style the bodywork. The first series car was to become a typical Giugiaro “folded paper” design akin to the MKI Golf and the BMW M1. Petrolheads with their finger firmly on the automotive pulse will know all about the Delta Futurista launched by Automobili Amos at Grand Basel in early September. The consensus on this car has been pretty unanimous and generally involves words like “wow” “amazing” and “how much!?”. I may be in the minority, but I have taken a little more warming up to the idea of this car, though have since come round to it. However, the question begs: would I chop up a perfectly good Delta for a donor car? Think You Know Porsche History? Here’s Some Facts You Might Not Know! To celebrate the Porsche 70th anniversary year we have compiled this list of interesting Porsche trivia that you might not know. If you think you know everything about Porsche history, have a read and let us know if you have any other quirky Porsche facts we might have missed. Along with interesting tidbits about Ferdinand Porsche and the company’s beginnings, we’ve also included a handy guide to the Porsche 356 and the full story of how the world famous 911 got its name. An intriguing email recently arrived in the Hub’s inbox from Tim Williams, owner and pilot of a 1930 de Havilland Puss Moth. He got in touch with an exciting proposition for the Hub, as his plane once belonged to the Maharajah of Patiala who concurrently owned the 1928 Aston Martin S Type Sports in stock with Cotswold Collectors Cars at the Classic Motor Hub. Tim offered us the chance to reunite this pair of wonderful machines that once ran together on the Indian plains of Patiala. We jumped at the chance to put a date in the diary at the height of summer and waited eagerly for the reunion at a private airstrip just down the road from the Hub. After Ducati reigned supreme in the 90s with their formidable fully-faired 900 series superbikes, they presented the start of a new range of retro-inspired motorcycles at the Tokyo Motor Show in 2003. Aptly named the ‘Sportclassic’ range, It was a brave move for the innovative Italians which has brought them full circle, now producing bikes with a nod to those early café racer greats. In 2006 Ducati launched the Sport 1000S which took inspiration from the 1973 750 Sport and the Paul Smart Imola Desmo. This model in particular is the 2007 Ducati Sportclassic 1000S, a bike that need not be ashamed of its past and is certainly not to be confused with any “home brew” café racer. The 1000S is purpose built for the job – in short this means it’s uncompromising in its ride, impeccable in its handling and good looking from any angle. What we’re currently looking at is the start of adventure, whether looking at it, learning about it or even riding it. The Gladstone No.1 is certainly a talking point at The Motor Hub right now and for good reason. It’s difficult to know what the future might hold for the no-holds-barred classic supercars of the past, but surely it’s impossible for the “safety” experts to turn their noses up if they ever come face to face with the Lamborghini Miura. The name “Miura” comes from a breed of Spanish fighting bull, and the equally wild Lamborghini with its 350-horsepower, V-12 engine mounted transversely in the rear, is so bold, individualistic and unconventional that it’s hard to imagine it fitting into anybody’s arbitrary standards – safety or otherwise. On Sunday our 1st April Coffee and Classics gathering took place at The Classic Motor Hub – the first of 2018. After much anticipation we are delighted to report that it was considered by most to be a huge success. In excess of 280 cars registered to attend, which meant that it was a very busy start to the day to fit all the cars and motorcycles in, but once most visitors had made it through the event traffic, they were delighted with what we had on show. The first Coffee & Classics of 2018 is fast approaching, and following the incredible success of our New Year’s Day event, we’re expecting the 1st of April to be an absolute corker. Tickets have almost sold out already, and we have some superb new areas of The Hub that will be open to the public for the first time, including our new shop and café areas. If you haven’t already ordered your free ticket, there’s not much time left to book your place. On Sunday 25th February, The Classic Motor Hub hosted a meeting of the North Oxon & Cotswolds Area Military Vehicle Trust, whose members look after and restore the wide range of ex-military vehicles from both the UK forces and overseas. Attendees included a number of variations of the iconic Jeep, a Simca transporter, and a variety of wartime Austin vehicles. Last week members of The Classic Motor Hub team took a little trip across the channel to Paris to witness the Retromobile 2018 International Exhibition. After arriving in the driving snow on Tuesday evening, Richard, Hugh and Ben knew they were in for an interesting few days – and that’s before they even got to see any of the show. On 1st January The Classic Motor Hub hosted the Cotswold Classic Car Club‘s New Year’s Day charity event, which proved to be a roaring success. An estimated 750 people came to the event with over 400 cars passing through The Hub between 12 and 3pm (with many arriving even earlier!). The Club raised £658.45 for the Youth at Heart charity, who raise money for teenagers and young adults across Gloucestershire and the South West who were born with complex Congenital Heart Disease. At The Classic Motor Hub we regularly get some stunning motors into stock, but this December has been particularly special. We’re delighted to now be offering a 1992 Ferrari F40, 1970 Porsche 911 E and a 1963 VW Split Screen Camper for sale at The Hub. Keep on reading to find out more about these rather special machines. For many, the love for cars is born out of passion for witnessing cars pushed to their limits by skilled racing drivers. Maybe your passion was kick-started by seeing Ayrton Senna’s mastery in the wet at the 1993 European Grand Prix in Donnington, Sébastien Loeb doing the ‘Scandanavian flick’ to seal one of his nine FIA World Rally Drivers’ titles, or any other of the many unforgettable moments from over 100 years of motorsports. At The Classic Motor Hub, racing is in our blood; indeed a number of the staff here have competed in racing events over the years. We were recently invited to Blyton Park Race Track to test out two of the cars in our collection in their preferred habitat – on the track.